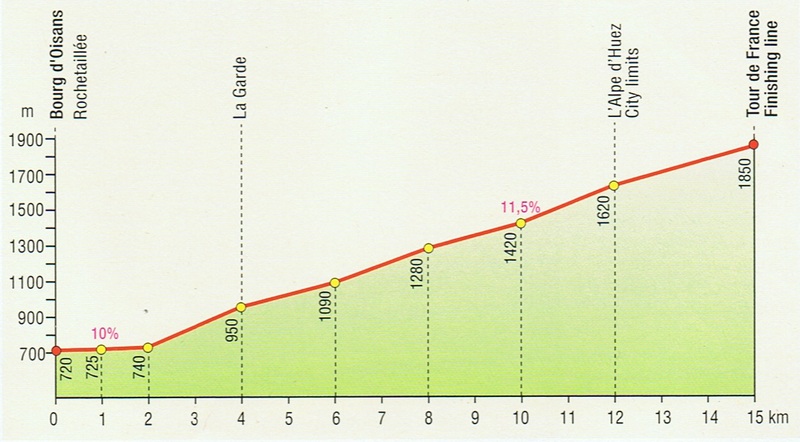 Overall ride and climb – 115 km and 2, 573m. 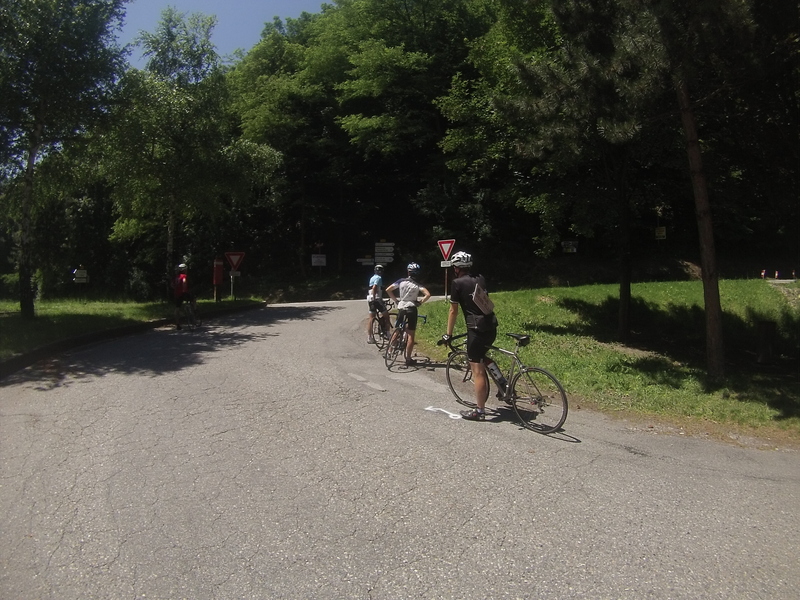 “The hottest, hardest, most unrelenting run I have done in 71 years”, Pat, age 71 years, tells the team as he wanders up to the already recovered group of relatively young international riders. Though, I would argue a slight exaggeration with regard to length of time Pat has been riding a bike – maybe 69 years if we count a toddlers tricycle – so fair enough. 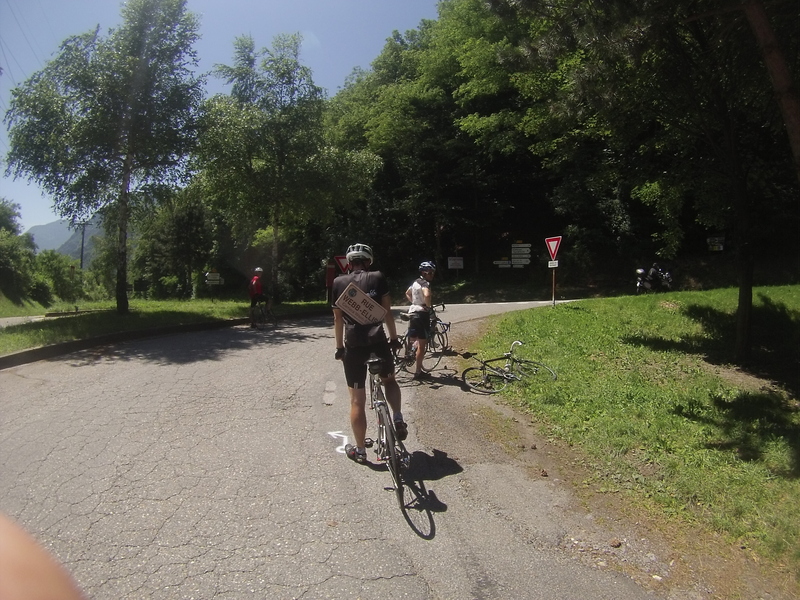 And yes, signally to everyone in the tour, prior to the ride, that the 3 Cols – Fleuries, Colombiere and Aravis, is “perfect to warm up your legs for the challenges to come”, is both a slight understatement, and entirely true at the same time. 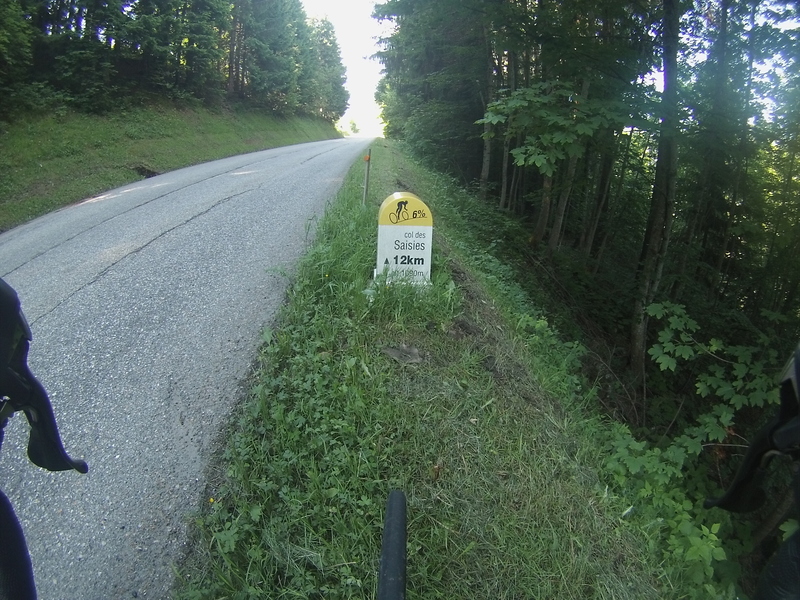 Here is a shot at end of hardest day I ever have ridden 100km 3.5 cols, one off the scale (13%) slope, stinking hot but amazing views. Pat’s general comment about the team: young, very experienced and exceptionally fit, and strong; they chased every metre as though it was a race. 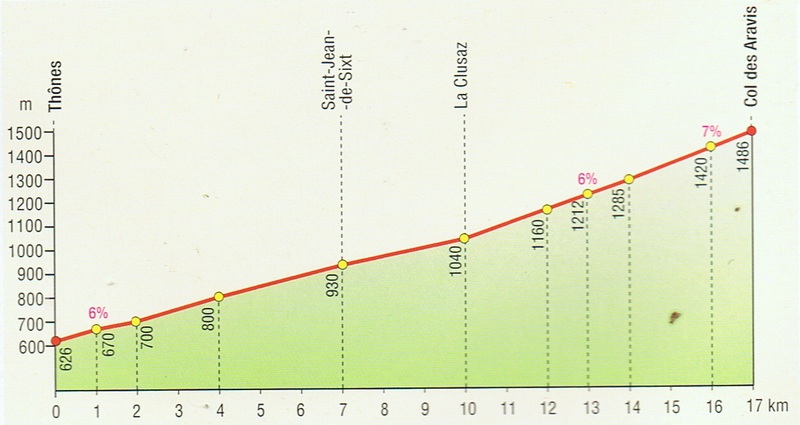 Overall ride and climb – 120 km and 2,422 m.
First ascent is Les Saises – a warm up ride. 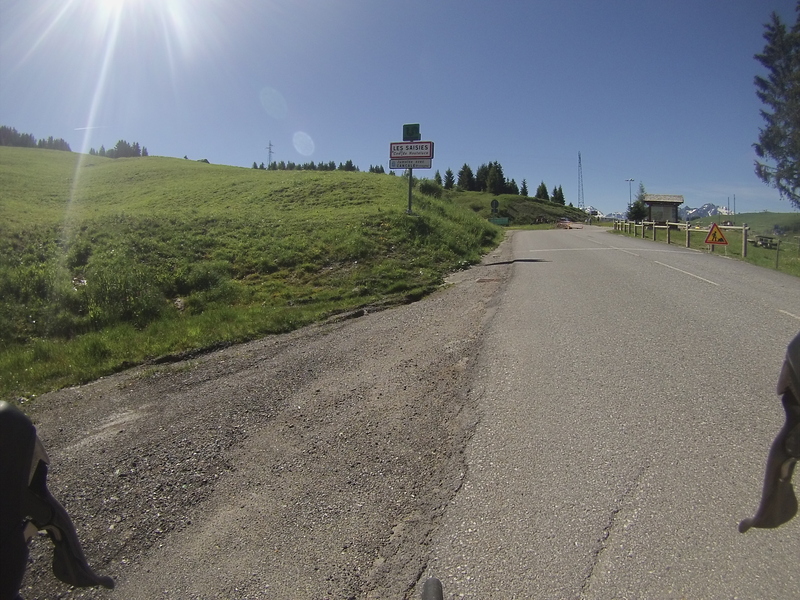 Then a leisurely ride through the winter Olympic city of Albertville, followed by a venture up to Col de la Madeleine (1,993 m). From here they all plunge (we are talking about Mountains, so when they say ‘plunge’, this is fairly accurate as Garry got up to speeds of 80km/per hour) down to the picturesque town of St. Jean de Maurienne. If you have ever had to endure through The Sound of Music, think of the scene where the nun is running of over a grassy hillock with huge mountains in the distance – and maybe a glimpse of ski field. 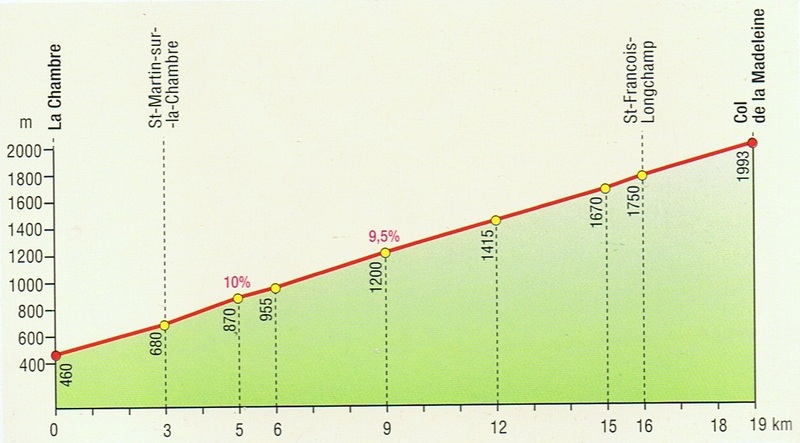 Overall ride and climb – 105 km and 3,196m. L’Alpe d’Huez – madness, and this was one of three climbs – Col du Mollard, Croix de Fer, and finally, a 21 hairpin ladder to L’Alpe d’Huez. Garry did all three – a challenge, and kept up with the pace ( I would like to say with ease, though let’s face it, none of this is easy). Pat used his deceptively good analytical skills and warmed up by stretching, and saying to himself – “I’m not completely mad”, and kept his energy for the iconic ride – L’Alpe d’Huez (Pat said – Imagine going up the Saddle Road, Palmerston North, then multiply that by 6). Pat said: Toughest climb ever, but made it all the way; totally shattered; brilliant views and with rue Webb Ellis sign featuring everywhere. Everyone here in the spirit of return of the sign – even the local French are intrigued and love the story. As Garry says, probably the oldest Palmerstonian ever to ride up here. For me it is quite something, and a moving place. I will send some pics soon. Many of the highest French Alpes easily seen all around. Tagged All Blacks, France, Menton, new zealand, new zealand rugby museum, Rugby, Tour de France, William Webb EllisBookmark the permalink. Awesome Garry (& Pat) Had my first day at Bike Barn Kapiti today, opens at the ends of the week! Living the dream!,guys . Great to read your blog,and again glad to see you are been wise Pat! Feel dizzy looking at the heights (on the chart) Ohakune was just for us to play on obviously! Go grandad Pat – don’t do yourself in please there are some keen rugby fans here in the Uk wanting to chuck a footie ball round with you!